Last summer, DC Comics fans saw a new version of the iconic villain The Joker with Jared Leto's performance in Suicide Squad. 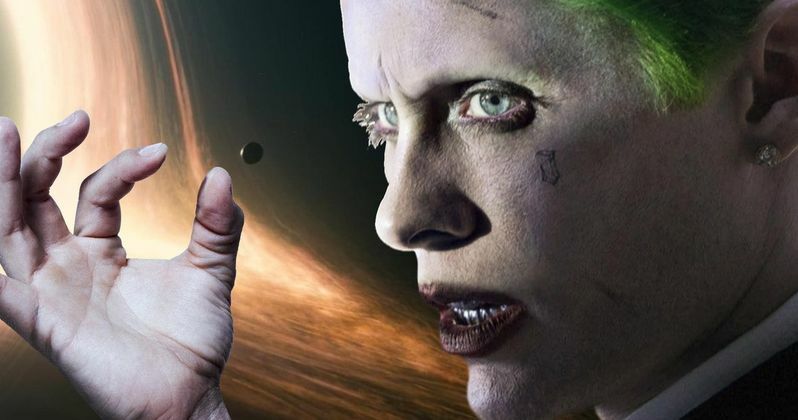 While the movie was a critical disappointment, a sequel is still believed to be in development at Warner Bros. A report surfaced in August, just weeks after the movie hit theaters, claiming Jared Leto was unhappy with the finished version of Suicide Squad, casting doubt on his return in a sequel and/or any other DC Comics movies. That may not be the case, as the actor sent out a couple of cryptic photos through social media earlier today. One which pays homage to an iconic comic, and another, more disturbing image has that fans scratching their heads. A report from September revealed that The Joker won't be featured in the upcoming Justice League movie, but there have been rumors that he may return in Ben Affleck's stand alone movie The Batman, or the new project Gotham City Sirens, which Suicide Squad star Margot Robbie will produce and star in as Harley Quinn. Last night, Jared Leto shared the iconic comic book cover of The Killing Joke on Snapchat, later reposting it on Twitter. While this surely doesn't serve as any official confirmation that he'll be returning as The Joker in any capacity, the second photo is even more bizarre. It shows a tooth necklace in a purple Gucci box, the Clown Prince's signature color. Perhaps this is yet another gift that Jared Leto will send to a future cast member when he returns as The Joker? Maybe it's an indication that we'll learned how he got all his teeth punched out, as he wears a grill in Suicide Squad, with his smile believed to have been rearranged by Ben Affleck's Batman. Most fans are left curious as to why these pictures was posted, and what it could all mean. Hopefully the actor will explain what is going on soon. But that might be out of character for Leto, especially if he's once again assumed the Joker persona. Last month, a report surfaced claiming there may not even be any room in Gotham City Sirens for The Joker to make an appearance, since the story focuses on Harley Quinn and other female villains such as Catwoman and Poison Ivy. But there hasn't been any official word on whether or not The Joker will show up. Suicide Squad director David Ayer is taking the helm on that project, which means Suicide Squad 2 may still happen, but not anytime soon, since Gotham City Sirens will take precedence over a true follow-up. There is another possibility that The Joker may pop up in though. An unconfirmed rumor surfaced last year that claimed Ben Affleck's Batman reboot will feature both The Joker and Red Hood. Another report claimed that the Red Hood won't appear in The Batman, but the story will include a number of iconic villains. None of those villains were mentioned by name, although it's completely possible that The Joker is one of them. There have been rumors that the studio is seeking a 2018 release date for The Batman, but that has yet to be confirmed. No production start date has been announced. We do know that Deathstroke is the main villain, though, so Jared Leto wouldn't be taking the lead in that capacity. With all of that said, it seems likely that, if The Joker were to return in the somewhat near future, it would be in The Batman, since Gotham City Sirens is taking precedence over Suicide Squad 2 at this point. It's also possible that Jared Leto simply posted that image to mess with his fans. It's worth noting that Warner Bros. released an animated version of Batman: The Killing Joke last year, just after the release of Suicide Squad, with Mark Hamill voicing The Joker. And, in the build up to Suicide Squad going into production, Jared Leto teased the same image in the flesh, sharing an image of himself that was a spoof of the Killing Joke cover. As we well know now, Suicide Squad and Killing Joke had nothing to do with each other. Take a look at Jared Leto's images below.